These spon­sor­ships pro­vide the high­est level of busi­ness expo­sure and greatest return on investment to our partners. Spon­sor­ship pack­ages vary based on the event and the level of sup­port. Various sponsorship opportunities exist for our Art for Arf’s Sake Art Auction, Pints for Pups, Tailwagger’s Trick-or-Treat, and the Walk for the Animals & Walktoberfest. For more information on these opportunities, or to host your own fundraising event for the animals in our care, contact Lauren Henderson, Director of Events & Corporate Relations, at 610-750-6100, ext. 211 or lhenderson@humanepa.org. Grocery stores, office suppliers, and home improvement merchants can make a special difference in animals’ lives! By allowing us to post our purchase lists in local stores, Humane Pennsylvania will promote those merchants to its constituents and encourage them to patronize our retail partners by purchasing gift cards or goods from our wish list. To sign up to be a retail partner, please contact Lauren Henderson, Director of Events & Corporate Relations, at 610-750-6100, ext. 211 or lhenderson@humanepa.org. Dog Bank Spon­sors agree to showcase a Humane Pennsylvania Dog Bank, which they keep in a vis­i­ble loca­tion, such as at a check­out reg­is­ter, for individuals to contribute spare change at a point of sale. A vol­un­teer comes to col­lect the money and bring it into the shel­ter. 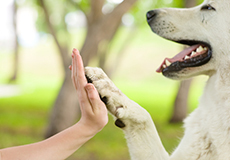 For infor­ma­tion on how your busi­ness can have a dog bank, con­tact Lauren Henderson, Director of Events & Corporate Relations, at 610-750-6100, ext 211 or lhenderson@humanepa.org.